- You'll start off in the Blacksmith's House. No warm welcomes here, that's for sure. - Head outside. You'll quickly learn that the monsters here are a lot tougher, particularly the bomb-wielding cyclopses. I highly suggest using Rods and other weapons in all of your fights from now on. Your sword just won't cut it anymore, even if it is the Master Sword. Activate the weather vane, check the left side of the house of a Maiamai, and leave the premises. - Start by checking out Link's House. It's now an abandoned, messy shack. Check around back to find a Bomb spot that will lead to a Bottle, grab the Maiamai from the stone bluff behind the House, then edge through the glowing crack at the base of the entrance. This will instantly warp you back to Hyrule. There are cracks all over Hyrule and Lorule; you just need to look for 'em. - Return to Lorule. 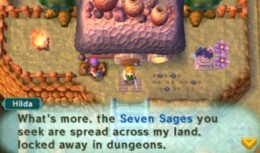 Check the grove to the southeast of Link's House. It's now home to Octoball Derby, a baseball game. Aim your swings with the bat and knock balls into pots to earn rupees. Aim for the golden pots to gain extra rupees; hit low-flying birds for even more. If you manage to score 100 rupees or more (hitting birds is a must - try a neutral, straight-on swing) you'll win a Heart Piece. While here, check under the skulls to the left of the players to find a hidden Maiamai. Now let's have a look at Thieves' Town, the dark approximation of Kakariko Village. - Be careful, for starters. Unlike peaceful Kakariko, Thieves' Town is plagued by monsters. The streets are not safe. - After paying, drag a Bomb Flower to the northwest side of the store to find a giant rock. Destroy it and you'll find a fairy fountain inside where you can throw rupees. I'm honestly not sure what it does to donate just yet. - Drag another Bomb Flower to the screen south of the Octoball pitch. There's a rock formation with a chest on top. Blow up the rock in front of the formation to find a cave beyond. Inside is a chest containing 100 rupees. 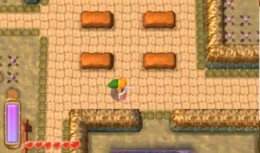 - There's another Rupee Rush game in Lorule, in the same place as Hyrule. The cost is 100 rupees this time, with more chances to earn - but also more chances to lose. Get 200 rupees or more in one go and the guy will give you a Heart Piece. You can also find a Maiamai on the rear wall of the Rupee Dash courtyard. - Dash against the southeast tree in town. A Maiamai is waiting inside its branches. - The Milk Bar is next. The owner here won't sell you anything, and, well, everyone in here is kind of a jerk (except the cucco lady, who's just kinda sad). One woman will speak of a Treacherous Tower atop the mountain in the north, though, which you may want to visit some day. 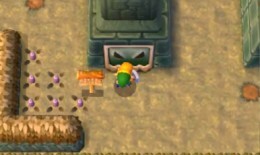 - The cucco coop next door is abandoned, but you can slip through the building to reach a bundle of rupees in the yard. - The last burnt-out house on the southern row contains a Maiamai. - North of the cucco shed's remains is a courtyard with some masked weirdos, as well as the local weather vane. Next to this courtyard is another husk of a house; inside is a crack leading to Hyrule. Go through and you'll appear in a locked house in Kakariko Village. The woman inside, who reacts oddly to a peeping tom, will give you a Heart Container. Huh. - At the east end of the second row is a Fortune's Choice game. In Lorule you pay 200 rupees for the chance to open three chests out of fifteen. The chests contain one rupee, twenty rupees, one hundred rupees, three hundred rupees, a Monster Tail or Monster Horn, or, if you're very lucky, a Heart Piece. I suggest picking three chests and just opening them over and over until you get the Heart Piece. After that... meh. Stop playing. Sometimes you get a profit, but usually you'll sit at even. - North of here, on the edge of town, is a shed. Locked. Oh well. - Continue west along the upper row. You'll find a pair of statues. We'll come back to these momentarily. - Last up is an Item Store. The merchant inside will sell you a Bee for 88 rupees, a Golden Bee for 9,999 rupees (ouch), a Fairy for 77 rupees, and a Shield for 50 rupees. Buy as you see fit, but, uh, not the Golden Bee. Yeesh. You need one for the Bee Guy back in Kakariko, but there are better ways to get one. - Return to the statues and check the left one. A thief behind the door will ask for you to continue a set of lyrics. Choose the following: 'A narrow path', 'Really despair', and 'To thievin''. Enter the door that opens and you'll be inside a dungeon! Woo, sounds like fun times. Heal up, grab a Fairy or two, and head inside. Return to the Blacksmith's Shop after upgrading your Master Sword in Hyrule with two pieces of Master Ore. If you have two more pieces of Master Ore the Blacksmith will upgrade it further to Master Sword LV 3. Doesn't get any stronger than that, Link. One screen west of the Abandoned House (Link's House in Hyrule) you'll find a patch of grass. Chop through it to find a hole. Below is a treasure hunter puzzle of sorts that requires the Pegasus Boots at a minimum and, preferably, Bombs. Speed your way to the chest in the middle to find 300 rupees. On the same screen as the aforementioned hole is a large rock. Beneath is a Maiamai. South of the Octoball pitch, against the cliffs surrounding Misery Mire, is a crack leading to Hyrule. Go through to come out atop a cliff. Lift a rock here with the Titan Mitts to find a Maiamai. In the cave next to this rock is a treasure hunter challenge; float down with cucco in hand, past the wind currents, to find 100 rupees at the bottom. I had the most success by aiming for the right side of the shaft on the initial approach. If you go through another crack on the Hyrule side in this area you'll come out in Lorule, on a cliff. Merge and walk left to find another Maiamai. Hookshot northwest of here to reach a small platform where you'll find a chest containing 100 rupees. One screen north of the Blacksmith's Shop is a Fortune Teller's Tent. This guy performs the same function as his counterpart in Hyrule. Outside the Tent are a few huge rocks; get the Titan Mitts to lift 'em and you'll find a Maiamai beneath one.